I am a huge fan of Marie Segares. She's a crochet and knitting teacher, designer, blogger at Underground Crafter and podcaster living in New York. Her podcast is the Creative Yarn Entrepreneur Show and the episodes are packed with useful information about how to run your yarn business. When I was figuring out how to write and publish my first crochet pattern her mini series was invaluable. 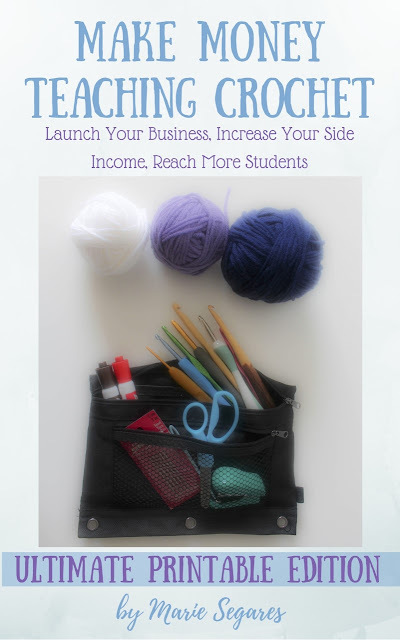 I'm a member of the Facebook group that is linked with the Show and when she asked for reviews for her book "Make Money Teaching Crochet: Launch Your Business, Increase Your Side Income, Reach More Students" I was only too happy to do so, having bought it when it first came out last summer. The book is a extremely good hands-on guide to how to develop a part-time business teaching crochet. It would be perfect if you're just starting out and it will definitely be useful if you're already a teacher wanting to expand your business and make more money. The book is wonderfully comprehensive and covers a wide range of essential topics in five sections: goal setting, business basics, marketing strategies, class preparation and teaching resources. Marie presents the information with all the options and then you work out how your own business is going to operate by filling in worksheets. The book is packed with so many good tips and valuable information. That's what Marie does well! I found the first section on goal setting extremely useful and working through Marie's guiding questions really helped to clarify my next steps in teaching. I've been teaching just over three years now and this book inspired me to apply to teach at my very first Fiber Fest this Summer. Business basics covering business structure, payment, pricing and tax is aimed at those starting out. Marketing strategies is a really good section which all teachers would learn from. The quick marketing 101 overview is useful and I really liked the worksheet on how to figure out your competitive advantage. It's a book to return to over time because there is so much information in here. I've only really touched a few things here that I liked but there were many more! I'm very big picture in the way see things and operate and this book fills in all the details for me, which is really what I need. For more information on how to buy the book visit Marie's Creative Yarn Entrepreneur website. And Marie has very kindly offered to provide a copy of the ebook version as a giveaway so just message me on your preferred social media channel within the next week (before midnight on August 26th ). You can be anywhere in the world! I'm on Instagram, Twitter, Ravelry and Facebook as Crafty Escapism and I'll pick one person at random to receive this book! Good luck and have a wonderful yarn filled week y'all. Thank you Helen. It really is a super useful book!